Previous research by the U.S. Centers for Disease Control and Prevention has shown that Hispanics are twice as likely as non-Hispanic blacks and three times as likely as non-Hispanic whites to lack a regular health care provider.3 Hispanics are a diverse community, and the Pew Hispanic Center/Robert Wood Johnson Foundation Latino Health survey of 4,013 Hispanic adults explores not only their access to health care, but also their sources of health information and their knowledge about a key disease (diabetes) at greater depth and breadth than any national survey done to date by other research organizations or the federal government. It finds that among Hispanic adults, the groups least likely to have a usual health care provider are men, the young, the less educated, and those with no health insurance. A similar demographic pattern applies to the non-Hispanic adult population. The new survey also finds that foreign-born and less-assimilated Latinos—those who mainly speak Spanish, who lack U.S. citizenship, or who have been in the United States for a short time—are less likely than other Latinos to report that they have a usual place to go for medical treatment or advice. Nevertheless, a significant share of Hispanics with no usual place to go for medical care are high school graduates (50 percent), were born in the United States (30 percent) and have health insurance (45 percent). Indeed, the primary reason that survey respondents give for lacking a regular health care provider is not related to the cost of health care or assimilation. Rather, when asked about why they lack a usual provider, a plurality of respondents (41 percent) say the principal reason is that they are seldom sick. As for sources of health information, about seven in 10 Latinos (71 percent) report that they received information from a doctor in the past year. An equal proportion report obtaining health information through their social networks, including family, friends, churches, and community groups. An even larger share (83 percent) report that they obtained health information from some branch of the media, with television being the dominant source. Not only are most Latinos obtaining information from media sources, but a sizeable proportion (79 percent) say they are acting on this information. It is beyond the scope of this report to assess the accuracy and usefulness of health information obtained from non-medical sources, but the survey findings clearly demonstrate the power and potential of these alternative outlets to disseminate health information to the disparate segments of the Latino population. Regarding the quality of the health care they receive, Latinos are generally pleased, according to the survey. Among Latinos who have received health care in the past year, 78 percent rate that care as good or excellent. However, almost one in four who received health care in the past five years reported having received poor quality medical treatment. Those who believed that the quality of their medical care was poor attribute it to their financial limitations (31 percent), their race or ethnicity (29 percent), or the way they speak English or their accent (23 percent). The PHC/RWJF survey also asked respondents a battery of eight knowledge questions about diabetes, a condition that afflicts an estimated 9.5 percent of Latino adults, compared with 8.7 percent of non-Latino whites.4 Nearly six in 10 respondents (58 percent) answered at least six of the eight diabetes questions correctly. Better educated and more assimilated Latinos scored better, as did those with a usual health care provider. 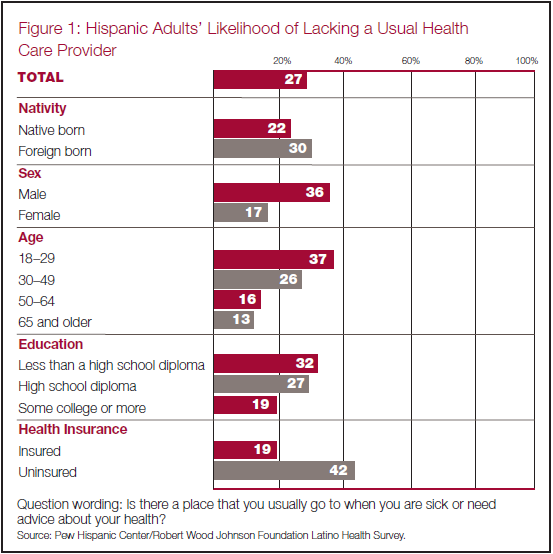 Some 73 percent of Latino adults report having a usual place where they seek medical help or advice, while 27 percent have no usual health care provider. As in the general population, males, the young, and the less educated are less likely to have a usual health care provider. 36 percent of men lack a usual provider, compared with 17 percent of women. 37 percent of persons ages 18–29 lack a regular place to obtain health care, compared with 13 percent of persons ages 65 or older. 32 percent of adults with less than a high school diploma lack access to a regular place for health care, compared with 19 percent of people with at least some college education. Foreign-born and less assimilated Latinos are less likely than other Hispanics to have a usual health care provider. 30 percent of Latinos born outside of the 50 states lack a usual place for health care, compared with 22 percent of U.S.-born Latinos. 32 percent of Latinos who mainly speak Spanish lack a regular health care provider, compared with 22 percent of Latinos who mainly speak English. 49 percent of Latinos who have lived in the United States for less than five years lack a usual health care provider, compared with 21 percent of those who have lived in the United States for 15 years or more. Some 42 percent of the Latinos who have no health insurance lack a usual health care provider, compared with 19 percent of the insured. The primary reason that respondents give for not having a regular health care provider is their belief that they do not need one. 41 percent of those lacking a regular provider say that they are seldom sick, and 13 percent say they prefer to treat themselves. 17 percent report a lack of health insurance as the primary reason that they don’t have a regular provider, and 11 percent report that the cost of health care is prohibitive. 3 percent report that they have trouble navigating the U.S. health care system. A significant share of Hispanic adults who lack a regular health care provider are native born, have a high school diploma, speak English and have health insurance. 50 percent of those with no usual health care provider are at least high school graduates. 30 percent of those with no usual health care provider were born in the United States. 52 percent of those with no usual health care provider speak predominantly English or are bilingual. 45 percent of those with no usual health care provider have health insurance. 77 percent of Latinos who have received health care in the past year rate that care as good or excellent. Of those Latinos who have received health care in the past year, assessments of the quality of care are higher rated among those who have health insurance and a usual health care provider. 80 percent of people with a usual health care provider state that their health care was good or excellent, compared with 64 percent of people with no usual health care provider. 80 percent of the insured rate their health care as good or excellent, compared with 70 percent of the uninsured. A plurality (31 percent) attribute this poor treatment to their financial limitations. 29 percent attribute the poor treatment to their race or ethnicity. 23 percent report that their accent or the manner in which they speak English contributed to their poor treatment. Some 71 percent of Latinos report getting information from a medical professional in the past year, while 28 percent report having obtained no information at all from a health care professional in that time. 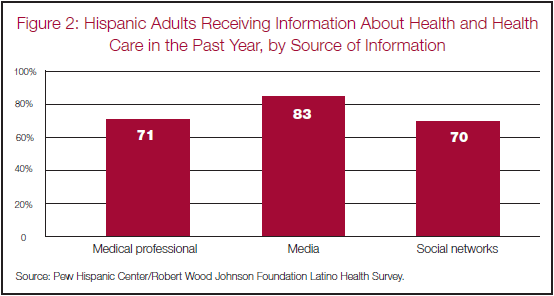 Most Latinos receive information about health care either from the media, or from their families, friends, churches and community groups. 83 percent report obtaining at least some information about health and health care from television, radio, newspapers, magazines or the Internet in the past year. 70 percent report obtaining information from family and friends, or churches and community groups in the past year. Television is an especially powerful conduit of information; 68 percent of Latinos report obtaining health information from television in the past year. 64 percent report that the health information that they obtained from the media led them to change their diet or exercise regimes. 57 percent report that the health information they obtained from the media led them to visit a health care professional. 41 percent say that the information they obtained from the media affected their decision about how to treat an illness or medical condition. In a battery of eight questions assessing diabetes knowledge, 58 percent of respondents scored “high,” meaning they correctly answered six or more of the questions. Better-educated, more assimilated Latinos are more knowledgeable about diabetes. 50 percent of adults lacking a high school diploma score high on the knowledge battery, compared with 70 percent of adults with at least some college education. 60 percent of naturalized citizens score high on the knowledge battery, compared with 48 percent of immigrant respondents who are neither citizens nor legal permanent residents. 50 percent of immigrants who have lived in the United States for less than five years score high on the knowledge battery, compared with 61 percent of immigrants who have lived in the United States for 15 years or more. 61 percent of adults with a usual place for health care scored high on the diabetes knowledge index, compared with 50 percent of adults with no usual place for health care. Among adults diagnosed with diabetes, 73 percent scored high on the knowledge test, while 27 percent answered five or fewer questions correctly.